I've never considered myself or my house to be coaster-worthy until this summer. I started noticing sweaty little glasses of Pioneer Womans (WONDERFUL) iced coffee leaving little rings on my fake cherry coffee & end tables. I got to work on some cute little coaster and now I can't stop. 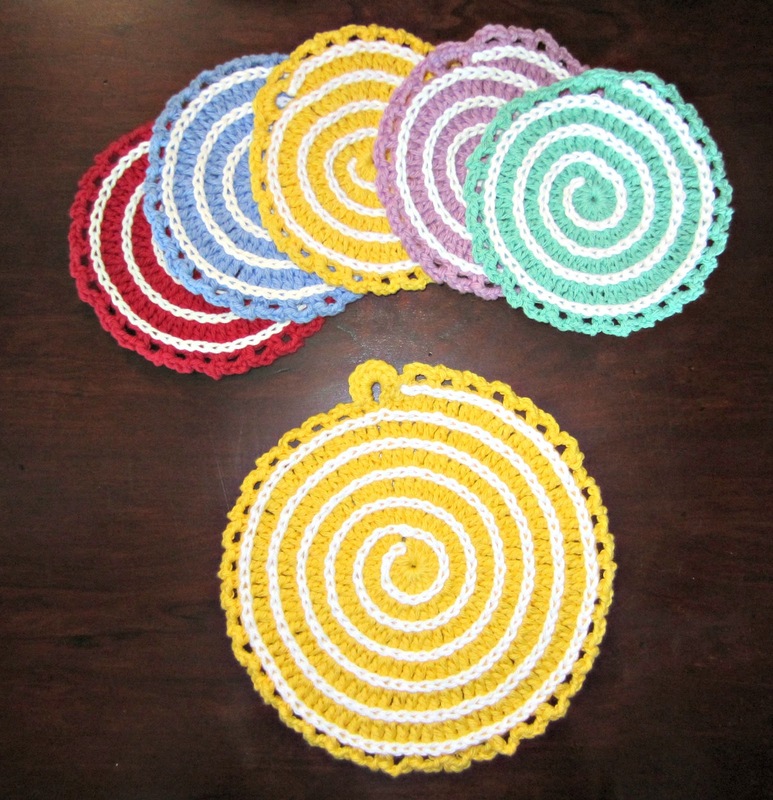 This cute little Spiral Coaster pattern is free from Made in K-Town. I used Lily Sugar n' Cream Cotton and an F hook. I used all the colors I had and even made a trivet by adding on a two rounds ( Round 5:1 dc in next 3 stitches, then 2 dc and repeat to end. Round 6: 1 dc in each of next 4 stitches, then 2 dc in next and repeat to end. Round 7: Work lacey edge as in original pattern ). At first the coaster will seem a bit floppy, but the added white stitches on top stiffen it up perfectly. I loved being able to do stripes without having to change my yarn every other row! More to come...I just bought some orange, lt. blue and fuschia! Thank you for entering the giveaway at Hopeful Threads and showing your support by adding this month's badge to your sidebar! Good luck with the giveaway!